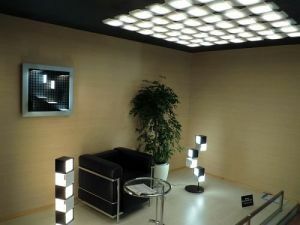 Japan's OLED lighting fair started in March 8th, and we got some interesting OLED Lighting news. NEC lighting is showing several OLED lighting lamps using their upcoming panels - which will be 10x10cm ones offering 60lm/W efficiency - which is actually very good. The company plans to commercialize them in fiscal 2011 (which ends of March 2012). NEC is using UDC's PHOLED materials, which explains the relativly high efficiency. 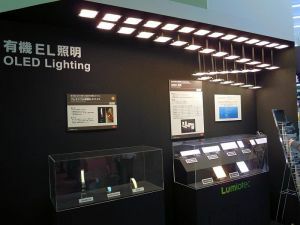 Panasonic Electric Works is another company that's developing OLED lighting panels based on UDC's materials, and now we hear that they too plan to commercialize their panels in 2011. We don't have any technical details on those panels yet. Other companies on show include Odelic (which are designing lamps based on Lumiotec's OLED panels), Kaneka, Novaled, Mitsubishi Electric and Rohm. Rohm has been showing flexible OLED panels and wants to realize 'bendable lamps'.